Do you have a question about Kosher food in KW? Click here to ask the rabbi. There are no kosher restaurants currently operating in the KW area. 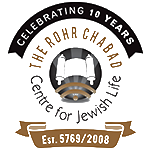 Chabad offers catering for local firms on a per-request basis. Click here for the menu and online order form. 1. Zehr's, Valu-Mart and Sobeys carry frozen Dempster’s “Home Bakery” baguettes and dinner rolls, certified by Chof-K. They are Pas Yisroel when baked by someone Jewish. All breads from the All Star bakery are kosher and Pas Yisroel. 2. Beechwood Zehr’s on Fischer-Hallman and Erb and Valu-Mart in the Waterloo Town Square carry a variety of Matzos. 4. Raw frozen challah, which you can then bake at home, is available at Vincenzo's and at Sobeys on Ira Needles. Sobeys Ira Needles also carries assorted frozen bagels and breads. 1. Frozen kosher chicken, frozen beef burgers and fresh meat (roasts and cold cuts) are available at Sobeys on Ira Needles. One may still place an order for bi-weekly delivery from Hamilton Kosher to Vincenzo's, who also stock frozen chicken and beef products. 1. Sobeys on Ira Needles carries fresh kosher fish. Ask for the kosher salmon at the fish counter. 2.The Wholesale Club carries fresh salmon with an OU. Kosher lox and herring are available in many supermarkets. Cans and packets of tuna and salmon are also widely available. A wide variety of Zoglos Vegetarian Choice products, which are kosher, can be found in Sobeys Bridgeport and Beechwood Zehr's. Sobeys on Ira Needles carries some varieties of "Haolam" brand kosher cheese, as well as kosher frozen pizza. In Ontario, all wine is sold at the government owned stores known as “LCBO” (Liquor Control Board of Ontario - www.lcbo.com). Most LCBOs in our area stock some kosher wines, with the largest selection available at the LCBO next door to Sobeys Ira Needles. Most of the kosher wines can be found in the vintages section, and some stores actually have a kosher section as well. Be sure to check for a reliable kosher symbol on the label. Beechwood Zehr’s carries Kedem sparkling grape juice. (The COR symbol often includes numbers in the circle. This does not have anything to do with the kosher status of the item in question). Many kosher products are available in local supermarkets – be sure to check products for reliable kosher certification. Beechwood Zehr’s has a small kosher section with Matzos, instant soups, macaroons, Schmerling's milk chocolate and other non perishables. A number of certified kosher products can also be found in the health food/organic section of the same store, including Cholov Yisroel Glutino chocolate wafers, bearing an MK. Pas Yisroel: In a series of rabbinical ordinances instituted as a safeguard against intermarriage and assimilation, the Sages forbade the consumption of the wine, bread and cooked foods of a non-Jew, even when these do not contain any non-kosher ingredients. Technically, the prohibition of non-Jewish bread applies to home-baked bread, not to bread prepared in a commercial bakery. Nevertheless, it is the custom of many communities to use only pas yisroel ("Jewish bread") rather than avail oneself of this leniency.